Chop up some fresh fruits and vegetables, and enjoy it with some homemade dressing. It's perfect as a side dish or a quick meal! Place fresh leafy greens in a large bowl or on a plate. Combine apples, celery, clementines, and red pepper. Place dressing ingredients in a container with lid and shake until mixed. Pour over salad chopped produce and place on bed of greens. 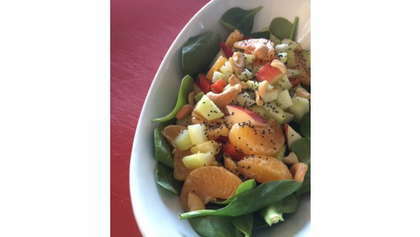 Top with cashews and a sprinkle of poppy seeds.